Judd Apatow fans won't have to wait until the inevitable Paul Rudd/Leslie Mann vehicle This is 80 to get new material from the writer/director. As long as they have a Netflix account, that is. [Netflix] has ordered a 10-episode first and 12-episode second season of Love, which Apatow co-created and wrote with Rust and Lesley Arfin (Brooklyn Nine-Nine). Season 1 will debut in 2016, Season 2 the following year. Apatow Prods. and Legendary Television are producing, with Brent Forrester (The Office) joining Apatow, Rust and Afrin as executive producer. Love follows Gus (Rust) and Mickey (Jacobs) as they navigate the exhilaration and humiliations of intimacy, commitment, and other things they were hoping to avoid. Notable: Lesley Arfin was a staff writer on Girls. 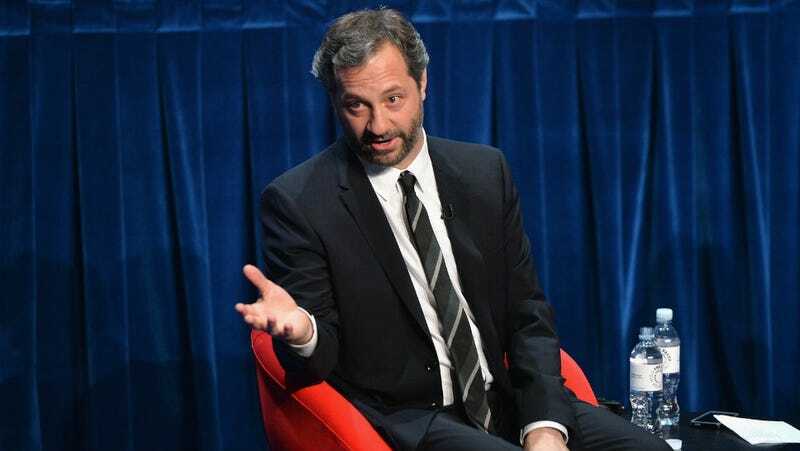 Apatow has not done a television show since Fox's Undeclared in 2001. According to Deadline, the series got a two-season commitment from Netflix, which is something only reserved for extra special super awesome projects from A-listers like Kevin Spacey for House of Cards. Gillian Jacobs once tweeted a link to something I wrote about a year ago, which means we are pretty much best friends. We're closer than that, even. She and I are Sisters of the Travelling Twitterhood, but still more than that. We basically share souls. I am essentially her because now, thanks to our Union of the Sacred ReTweet, I inhabit her mind, body and spirit. Therefore, I am available to answer any specific questions about her role in this project or the intimate details of her private life. Don't hesitate to ask. I am Gillian Jacobs. Thank you.